we should assimilate books into our model of the world, and then dispense with the book. I'm wondering if that's a better way of dealing with a diary too. In reading back on your emotional unloads you find there's a lot of "crap" in there that you must sift through to get to anything good or meaningful later. I'm wondering if there's an approach to processing your diary, just like you would a book, to actually make it meaningful later. Because keeping the full notebook with the idea that "this is my life in its complete form so I don't want to throw it away" just feels like hoarding. It could be true that there are better and worse ways to keep a diary. I don't have expertise in diary-keeping. @ctietze I do see your point. Basically is just FEELS different for whatever it's worth right? I do find this topic intriguing, however. Not just diaries specifically, but on our constant human need to keep things. The most obvious being physical things: it seems utterly preposterous to pay for storage to hold our junk, yet I never thought twice when my parents did it while I was growing up. Taking it further I began to question all the clothes in my closet, all the books on my bookshelf, all the old notebooks in my drawers. Each time I asked, "Would I really need to use this in the future?" And the most amazing realization was that I never missed any of it. And now all my personal belongings have been reduced to one carry-on suitcase and a briefcase, as I travel the world for work...I still never look back on anything I gave away. As the complexity of my work has grown, the tools I use to complete the work have become simpler in fact. In this same light I look at the digital word and find we are following the same human patterns. It just doesn't feel like it because it's in digital "bits". You address it quite well in your concept of Collector's Fallacy. 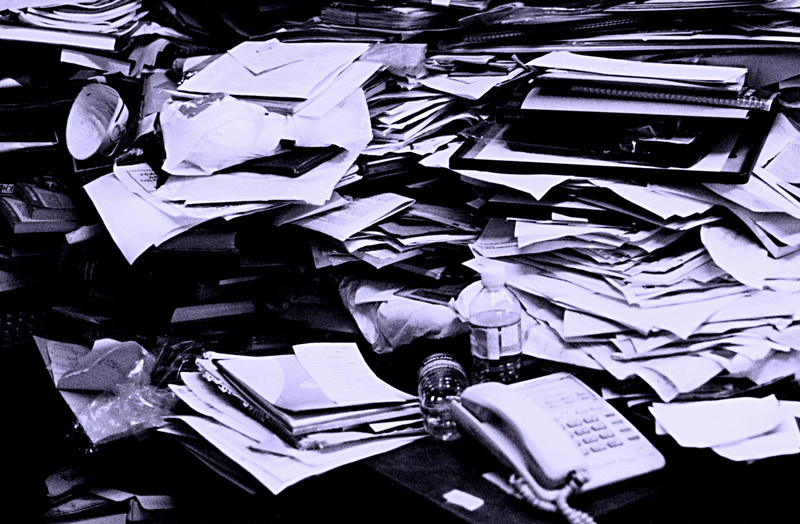 Not only is Collector's Fallacy characteristic of our tendency to procrastinate (i.e. I'll read through this later), but also in the basic human tendency to collect -- no different than the old couch in my parent's attic. While I have challenged myself on throwing away all material possessions and haven't looked back, I'm interested in this challenge with the digital world as well. Something as "special" and "personal" as a diary is a nice artifact to challenge. Would we really miss it if it were gone? If we've already extracted 95% of its usefulness through the writing of it itself, or whatever originally inspired us to write a zettel note off of it...does it need to collect and continue to build up? Or should we embrace freedom of erasing the rest of the "junk" thoughts from our past and look forward to bring on new ones. Focusing on the signal, letting go of the noise. For diaries, maybe there's freedom in forcing yourself to process them and then let go, just like you do with other people's work. Or maybe it doesn't matter. But in everything we do we must constantly remember that if we begin to challenge ourselves on what we actually need, both physical and digital, we will find that we need much less than we think. And there is significant liberation if we face that challenge head on. One component of the problem is the scarcity of time. Everything what you do has an opportunity cost of not doing something else. If you fall for the collector's fallacy you are doing a lot of half-assed work. You think that you achieved something useful if you collected something. But in reality, you wasted time collecting something while not taking action because of it (think, write, self-transform). I see the Collector's Fallacy through these to lenses: Anxiety and doing things half-assed. Both are not very wise guiding principles. Opportunity cost is precisely the issue. I'd contend that at least some of the time, my time is better spent by starting to read Source B instead of thoroughly "verzetteling" Source A.
I have the same question to you I had in the other threads. How to you measure this improvement of time usage? Yes, I replied there. I think measuring any potential improvement would be more difficult in my circumstances than in (what I assume are) yours. Meanwhile, reading new stuff is interesting while processing old stuff is sometimes boring, and that's motivation enough for me! I'm hoping Tiago Forte will actually chime in on this forum at some point — he's definitely put more time and attention into these issues than I have. Meanwhile, reading new stuff is interesting while processing old stuff is sometimes boring, and that's motivation enough for me! If this is your goal then so be it. It's certainly a factor — and one that does impact my productivity, however you measure it. In retrospect, I sound a bit too bitchy. So, I want to give a disclaimer: I am digging to uncover possible problems. I am on your side. This is a factor but you can't evaluate it's impact if you don't measure anything related to your desired outcome. If you don't have numbers you can't properly tinker because you don't have any valuable feedback. Is a bit more fun really more productive than the opportunity costs of having to read and evaluate one piece more than one time? I have the feeling that you dodging the issue a bit. If you are reading a text you have a warm-up: You need to build a mental model to orientate within the text. The more you re-read a text the more warming-up you accumulate in your creative time. So, the more your have to re-read a text the worse the ratio of creative work and warming-up gets. This is when the barbell method of reading comes in: You read a text and mark all interesting (or not easy to understand) parts. Read fast because you can trust your future self: The important and the difficult parts will be processed carefully. Then you process the text from beginning to an end. Then: TO HELL WITH THE TEXT. The easy unimportant parts are ignored. The difficult and unimportant parts will be processed twice and never more. The important and easy parts are well processed and more than two times of processing are not necessary. When processing them thoroughly there will be positive black swans (more on that in the future) possible. Not possible with shallow processing. The important and difficult parts will be processed thoroughly. This is important because here is were fundamentals of creative work are layed. Low opportunity costs because only one time warming-up necessary and all black swans are captured. It is not a co-incidence that this looks similar to the Eisenhower-Matrix. There is an underlying principle which emerges when you combine the the concepts of antifragility, importance and cost per iteration. To wrap it up: I think that numbers and thight scrutiny are the way to go. (Only) What gets measured gets accomplished. I even process the my last post. I wrote 6 notes out of it and am now connecting the barbell method of reading, time framing of meaning and imperative measuring of creative work. If you really think about it: When does shallowness trump thoroughness in creative work, ever? Thanks for the time and thought you're putting into the conversation! At this point in my career, any actual writing and publishing I do is incidental to finding, signing, and serving clients rather than being an end in itself. That may change if and when I start offering business intelligence products or other writings for sale, but for now volume of published output would not be an effective measure of productivity for me. In fact, I'm not sure the benefit of even devising a measure of productivity other than revenue would be worth the cost. So there's that first of all. Second, being able to enjoy my workday is an end in itself, and I don't answer to a boss or investors, so I'm happy to sacrifice some reasonable small percentage of productivity if it means more enjoyment and less boredom. And to the extent that burnout is a risk, it's not unreasonable to assume (though admittedly difficult to measure) that more enjoyable work processes will boost my overall lifetime output. Third, I'm still not convinced that it's even possible to extract everything of value from a text in one pass. A year from now I'll have a different configuration of knowledge, interests, and attention, so it seems almost certain that I'll notice new aspects in re-reading any source text that's worth investing much time in in the first place. "Important" is not a fixed and inherent quality of the text, but always relative to my current situation and purpose in reading. Fourth, as for scattering and shallowness, no one else's texts are going to be completely aligned with whatever subject I'm focusing on anyway, so it's actually less scattered to concentrate on what's of interest in a given text right now and then continue to the next one, rather than trying to completely process those portions of the first text that I don't really care about. If I'm following Tiago's method, I probably won't be re-reading the whole text in the future, just revisiting those sections that caught my interest and condensing them a little more with each pass. I won't need as much warm-up time to get oriented as I'd need with a new text because I'll already have the breadcrumbs of highlights and notes from my previous pass, so my processing won't be shallow. I can get into deeper conversations at the party with people I already know from other occasions. I don't really see your barbell method as being all that incompatible with Tiago's progressive summarization. The major difference is that in the latter, the careful processing step can involve multiple passes, but is optional for any given document at any given time and is only done as-needed. In that case, I would introduce some proxy metrics so that you have some numbers to crunch. If you don't have numbers there will be always a big opacity to your system. See my other comments for fleshing out this position. How much is reasonable and how do you know that the sacrifice is reasonable? You can't answer both questions without any numbers. These are quantitative problems and therefore you need a quantitative approach. Even for the joy you need proxys to answer it (e.g. measuring on a scale from 1-6 how happy with your work day) if you want to protect yourself from cognitive vulnerabilities. It is not about maximizing value extraction from a text. Unless of course, you want to be the best expert on a particular text. I'd rather optimize my time. You are writing "relative to to your current situation" as if it is total relativity. It could be somewhat true if you are a christian and reading the bible to uplift yourself. But most non-fictional texts are quite simple to understand and contain a very limited number of distinct information pieces. Again the point from above: No numbers, no measuring. How can you know that the time of re-reading is worth it when you base your assumptions of a feeling based and untested theory? The wam-up time does not depend on the material you developed but rather on how your working memory functions. You brain needs that warm-up if you want to concentrate and go deep into any material. Scatteredness and shallowness are not functions of your interests. They depend on how your brain is working. It is like searching for a nice pair of jeans online and saying that your working mode is note scattered because you concentrate on your own desire for a pair of jeans. It is scattered because your brain is forced to work in a scattered way to cope with your approach. It is a relative rule of thumb: The less you can switch the better you are off.